A surprising level of scientific ignorance was displayed during what was supposed to be a hearing on how technology can address global warming. Instead, the hearing turned into a grotesque demonstration of a leading scientist fighting to correct all the anti-scientific beliefs of many committee members. Representative Mo Brooks (R–AL). Image via Wiki Commons. The Earth is not warming. Yet somehow, global warming is helping the Antarctic ice sheet grow. Oh, and the sea level rise is caused by tumbling rocks. These are just three of the assertions heard by Philip Duffy, president of the Woods Hole Research Center in Massachusetts and former senior adviser to the U.S. Global Change Research Program. Duffy participated in a hearing on the U.S. House of Representatives Science, Space and Technology Committee yesterday, where he was bombarded with questions — unfortunately, these were questions which showed a complete disregard of even basic science. Rep. Dana Rohrabacher (R-CA) started by accusing essentially the entire scientific community, saying that climate scientists manipulate climate data. He also complained that the committee isn’t investigating scientists more. There are literally tens of thousands of scientific, peer-papers that document man-made climate change. Politicians can control many things, but unfortunately for Rohrabacher, they can’t control scientific facts. Rep. Lamar Smith (R-TX), chairman of the committee, entered on record with another “idea”. He said that sea levels are not rising because of climate change, again contradicting thousands of scientific papers on the matter. As evidence, he quoted an opinion piece published in The Wall Street Journal — a piece written by Fred Singer, who is an advocate of climate change denial. Among other things, Singer also believes passive smoking isn’t bad for you and is funded by tobacco companies to promote his views. He is also financed by The Heartland Institute, an alleged think tank which promotes the denial of mainstream science (they likened climate scientists to terrorists). Smith essentially pitched an opinion piece in a newspaper ignoring decades of study by hundreds of research teams — and even that piece was penned by a disgraced author. 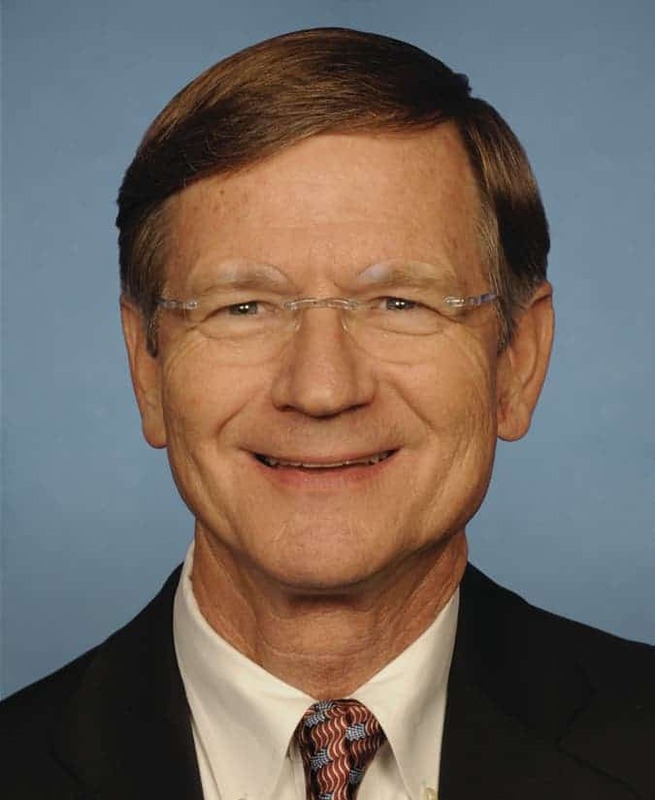 Lamar Smith’s official Congress picture. Moving back to the hearing: at one point, Lamar Smith showed a slide of two charts, claiming that this demonstrates how the rate of sea-level rise does not equal the sharp spike in the consumption of fossil fuels. However, Duffy pointed out that the chart only shows data from a single tide gauge station near San Francisco, and that’s not relevant for the global picture. Smith also completely ignored rising atmospheric CO2 levels and temperatures, both of which have risen steadily with the rise of greenhouse gas emissions. Duffy tried to explain that one station can’t explain the global situation, but Smith seemed to just not get it. However, the most absurd moment had yet to arrive. 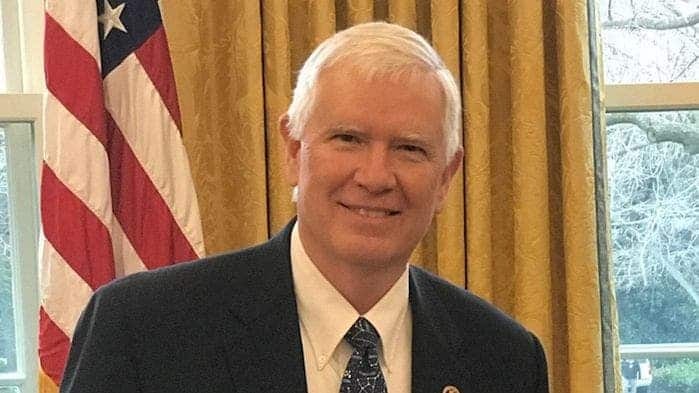 Rep. Mo Brooks (R-AL) questioned Duffy on the factors which cause sea level rise and tried to argue that rocks and river sediment — or as he called it, “soil or rock or whatever it is” — are responsible for the sea level rise. Needless to say, there’s no scientific evidence to support that. “I’m pretty sure that on human time scales, those are minuscule effects,” Duffy replied. Brooks also said that the Antarctic ice sheet is increasing — which was only true up to a few years ago. Just earlier this year, NASA climate scientists reported that the Antarctic ice loss has overall accelerated in the past decade. Furthermore, the temporary growth of the ice sheet was more than compensated by ice loss in other parts of the world and was consistent with existing climate models. Rep. Bill Posey (R-FL) tried to belittle scientists, saying that in the 1970s, scientists thought the Earth was cooling, referencing a fake Time magazine cover that has become a meme. It’s unclear if Posey knew he was using a fake image as “evidence” or was simply duped. Posey also asked how was carbon dioxide could be captured in permafrost in the periods before humans existed — showing a complete lack of understanding of basic scientific processes. Of course carbon dioxide has existed way before humans, and of course it was captured in the permafrost, just as it is today; that process is completely unrelated to human activity. What is relevant now, however, is that global warming is melting the permafrost, releasing that trapped carbon dioxide, which accelerates warming even more. So let’s take a step back and look at things for a moment. This is the U.S. House of Representatives Science, Space and Technology Committee. Not only do the committee members show a complete disregard of scientific evidence, but they also reference fake images from the internet, form their opinions based on incomplete or misleading articles, and show a severe lack of understanding when it comes to even basic environmental processes. This isn’t the first time something like this has happened. Unfortunately, this type of hearing often becomes an arena where lawmakers parade their lack of scientific understanding and attack climate science. Is it ignorance? Is it willful ignorance? Do these lawmakers really not understand what’s happening, or are they simply trying to please the funding and lobby groups that back them up? We don’t know, but at the end of the day, it doesn’t really matter that much. These are lawmakers in a science committee, and science illiteracy is simply unacceptable.